Cover the bowl with plastic wrap and place in the fridge for at least 30 minutes, preferably up to 1 hour. Preheat oven to 375°F. Prepare two baking sheets with nonstick silicon mats or parchment paper and set aside. Grab a medium cookie scoop and fill it halfway with dough, pressing it into the bottom and up the sides. Spoon a teaspoon of marshmallow fluff into the center, and then top with more dough to fill the scoop. Place each ball of dough on prepared baking sheets, with no more than 6 on each, evenly spaced out with plenty of room for the cookies to spread. Bake for 8-9 minutes until the cookies have spread and started to crinkle on top. Remove from the oven and let cookies cool for at least 15 minutes on the baking sheet itself – they will continue to spread and set a bit more as they cool. Carefully move to wire racks to cool completely. Enjoy! 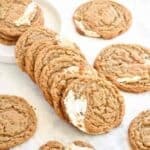 Store cookies for up to a week in an airtight container, with parchment paper between layers.